My dad was the king of getting a good deal. He was an Extreme Couponer before there were Extreme Couponers. As a teenager, driving practice meant driving my dad to 3 different grocery stores so he could be sure to get the best deal. I thought it was so ridiculous and insisted that we must spend more money on time and gas then he saved on food. Boy was I wrong. As I started my own family I discovered just how valuable those thrifty shopping lessons were. I was shopping on a college students paycheck eating .99 cent chicken drumsticks every night and making soup with the bones the next day. But we didn’t starve those first few years together and we certainly never ate Top Ramen for dinner. 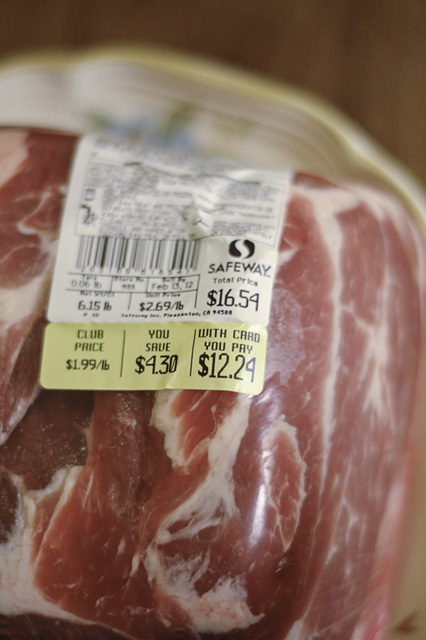 One of my dad’s favorite ways to save money was to buy a large portion of a cheap cut of meat. Something on sale, of course. 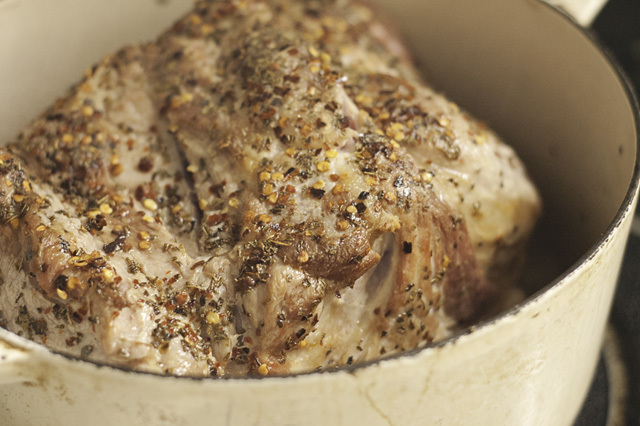 Pork Shoulder or Beef Roasts were always a big hit. Their cheap, often priced between $1.50-$2 a pound on sale and it’s almost entirely useable. One 6 lb pork shoulder will feed my little family of three for a week. Including several lunches. Pork Shoulder is one of those long cooking meats. Its full of connective tissue which can give you a very tough roast, if cooked quickly, or a fork-tender fall off the bone hunk of love if cooked slowwwwwly. There also needs to be a layer of fat on the top to help baste the meat as it cooks so don’t even think about cutting that off and throwing it away! 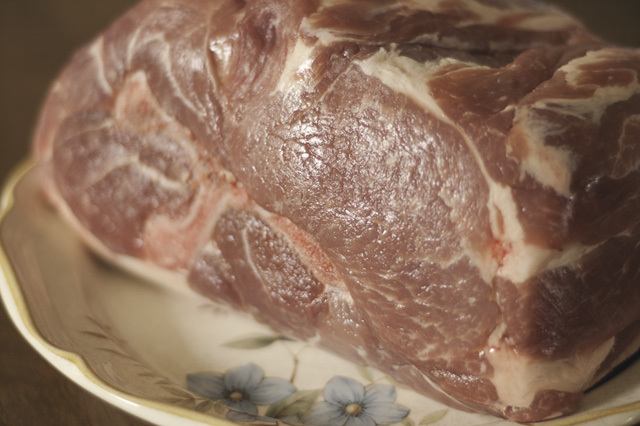 The fat adds loads of flavor and moisture to the meat. To make this roast all you need are some spices, water or stock, a large heavy dutch oven with lid and about 3.5 hours of lazy and relaxing cook time. your favorite spice rub. This time I used thyme, salt, red pepper flakes, and oregano. But another favorite is rosemary, garlic and thyme. You could also make a paste with oil and dried, ground and roasted Ancho or Guajillo chilies. 1. 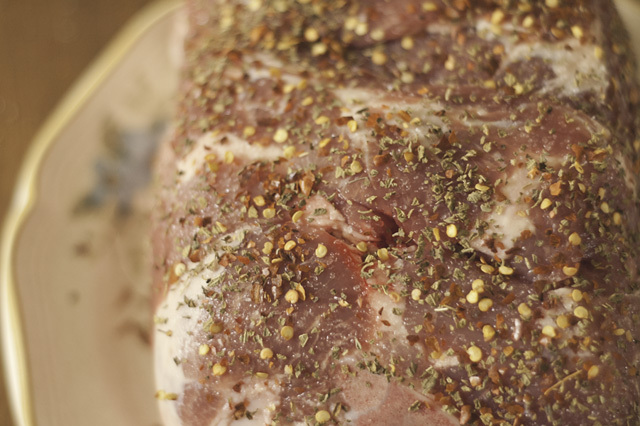 Remove roast from the wrapper and massage entire roast liberally with your spice rub or paste. Let sit in the fridge for at least an hour, but overnight is better. 2. When ready to cook, preheat the oven to 375 degrees F. Heat the dutch oven on med-high heat with 2-3 tablespoons of olive oil. When hot, add the roast and sear each side by turning the roast every 4-5 minutes until all the sides are crispy and brown. When done turn roast so the fatty side facing up. 3. 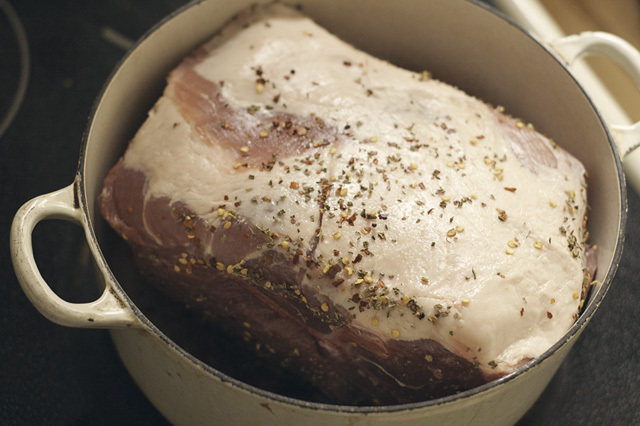 Fill pot with stock or water so that the liquid reaches almost halfway up the sides of the roast. Cover with the lid and place on the center rack in the oven. Forget about it for 2 hours. 4. After 2 hours take roast out of the oven and check for doneness. A small roast may be done by this point, but a larger 6 lb roast will need another hour or more. Carefully baste the roast with the juices at the bottom of the pot, cover and roast in the oven for another 1.5 hours or until the meat easily pulls away from the bone with a fork. 5. 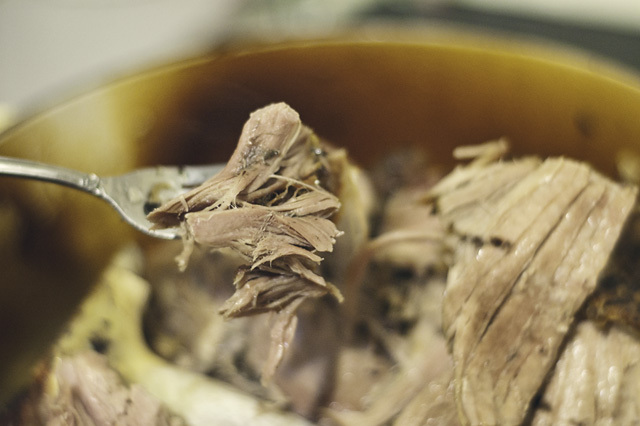 Remove the roast from the oven and shred with two forks, placing the meat in a separate bowl. Add a cup or so of the juices from the pot to the bowl and mix together with the meat. Discard any bone, if it had one, and the remaining fat and juices (unless you want to make gravy, but that’s another post). 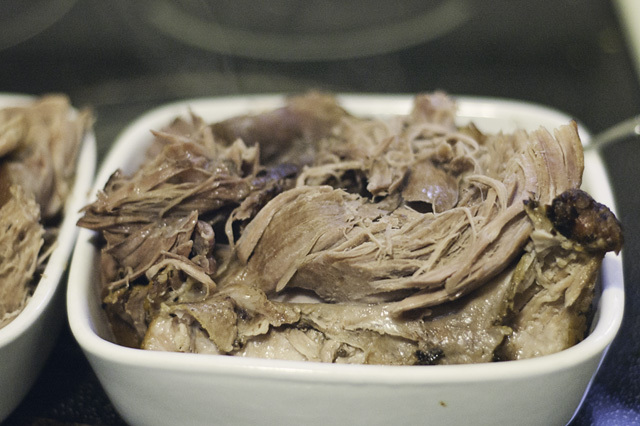 Enjoy your shredded pork in all sorts of dishes. This week we used ours for pork sandwiches, omelets, tacos, in our breakfast sandwiches, and even on pizza! When we finally got sick of pork roast I threw the rest in the freezer for another week when I don’t feel like cooking. Delicious! I fed 30 people one New Years Day on two bone-in shoulders, which I got for 99 cents a pound. It cost less than $20 and everybody stuffed themselves…and I had leftovers. Really a great cut of meat. My favorite way is to coat it in rosemary, garlic, crushed fennel, sea salt and pepper and let it sit for at least a day; then throw in a little white wine and cook it in the oven at — get ready — 225 degrees for about 13 hours. The house smells so good and it’s always a hit. 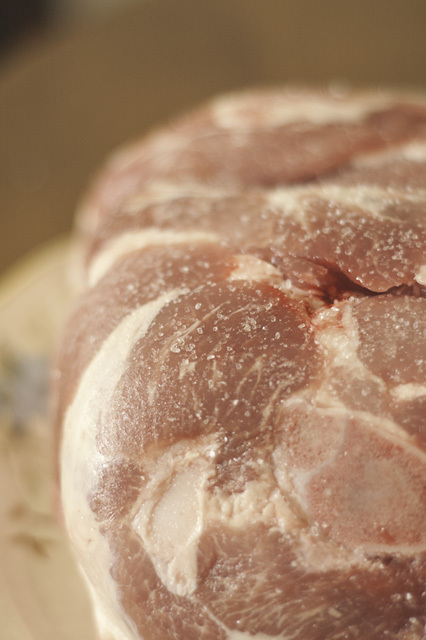 Your method looks great, especially if we want the pork sooner rather than later. Thank you! Thanks for this terrific dish. I’m making a version of it tonight for dinner. Awesome! Have you made this before or is it new to you?